The Market Analyzer can be customized to your preferences in the Market Analyzer Properties window. Sets the duration (in milliseconds) the instrument cell will remain highlighted. 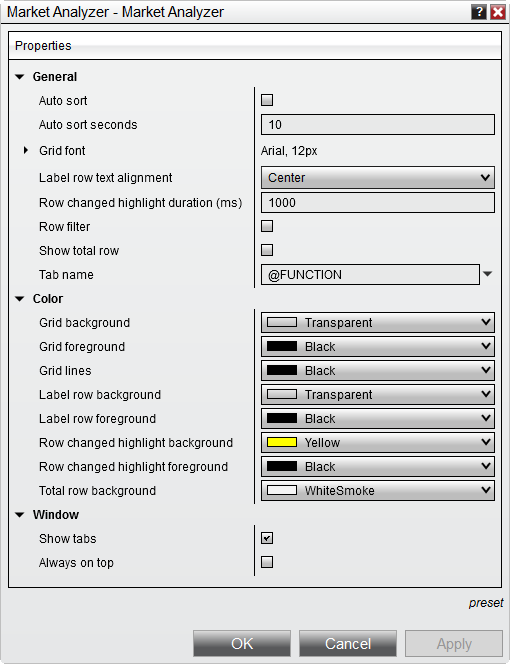 Enables/Disables the automatic filtering of rows from the grid display based on the Filter Conditions of the columns. Enables/Disables if the window will be always on top of other windows. Market Analyzer Columns along with custom properites can be saved within a Market Analyzer Template.